Manufacturer of high quality electrical products, PremSpec has chosen ED&I to launch key new lines for the company. Stand 67B will be the location to see the new range of single phase PremShield consumer units with the company’s new three-phase, British-built switch gear. Register for free to attend ED&I here. 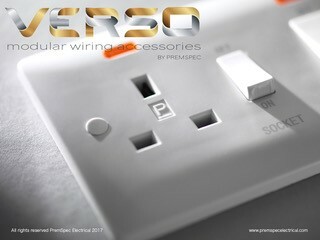 The company is also unveiling its entirely new modular wiring accessories brand called VERSO, the first opportunity for contractors to get a look at this exciting new line. PremSpec says the products have been designed using market leading components and will rival any other product in its category type throughout the market. The STYLE range of accessories will also be on show, a family of products which has seen many new lines added including a modular grid system of reach range including flatplate, screwless flatplate and even metal clad collections. The Style Advantage Decorative (flatplate) was recently used for a project involving three Hilton Hotels in London. William explains: “Our Style Decorative accessories have seen a huge increase in popularity due its incredible finish and quality. Each of our decorative finishes are completed by hand and all switches feature a full metal jacket for the cleanest and best possible aesthetic finish. ED&I will also witness the launch of three phase distribution to accompany the existing British built switch gear and single phase products. Visitors to the Stand will also be able to get all the information on the new ASCOT heating line which will see the company enter the oil filled electric heating market as from October with the addition of an app controlled Wi-Fi version available by November. PremSpec has a history of producing electrical accessories extending back over 40 years, with the company’s factory firmly established as a leading manufacturer of British standard wiring accessories. Check out the results of all this acquired know-how at ED&I.